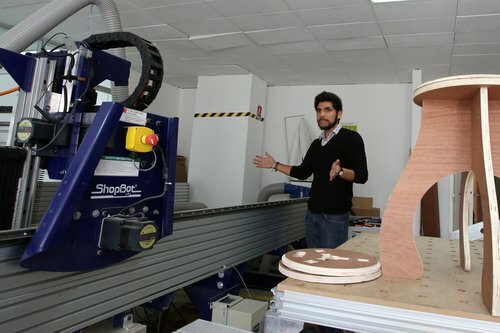 Corse-Martin, the local newspaper in Ajaccio, Corsica, recently wrote about the innovations made in Fab Lab Ajaccio and shed light on two of their new projects. The first project, Ragnar Robot, a robot equipped with a 3D-camera, can autonomously sort various objects, such as trash, food and manufacturing. The robot was made possible by the Danish company Blue Workforce whose files are all open-source. See what the Ragnar Robot can do at the RoboUniverse Conference & Expo April 11th and 12th in New York City. The second project, Falla3D, is a portable 3D-printer that allows remote areas to access this new technology making innovation easier. Thumbs up for Fab Lab Ajaccio, opened June 2015… their future looks bright! “It’s a real democratization of innovation” , says Simone Amber, President of Fab Lab Ajaccio, a Fabrication Lab launched by the entity Fab Lab Connect and partners: A Fundazione Crédit Agricole of Corsica, CampusPlex and the Centre sports and youth of Corsica. For the French speaking who would like to read more about this, you’ll find the article here.